Apple has released the fourth beta version of iOS 11.3 to users enrolled in the iOS beta testing program, alongside the fourth beta build of macOS High Sierra 10.13.4 for Mac system software testers. Separately, Apple also released tvOS 11.3 beta 4 for Apple TV users who are running a beta build on their devices. MacOS 10.13.4 High Sierra beta 4 can be downloaded now from the Mac App Store on any Mac actively enrolled in the macOS beta testing programs. 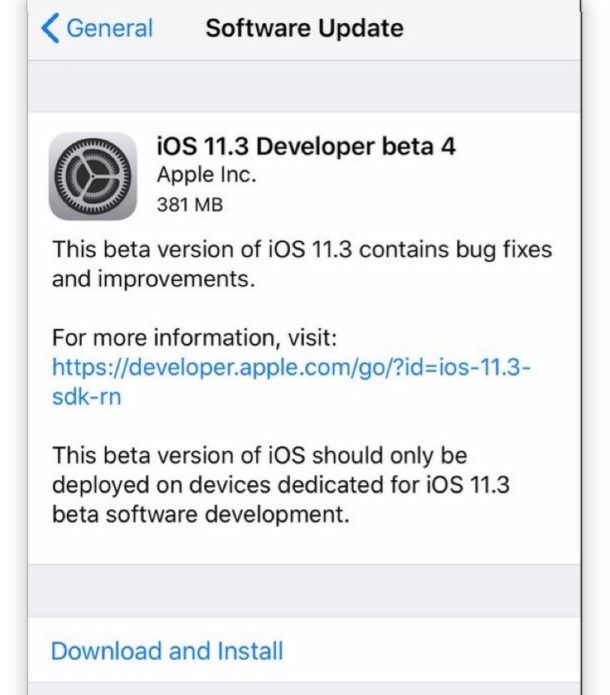 iOS 11.3 beta 4 is available to download now from the Settings app Software Update section on any iPhone or iPad enrolled in the iOS beta testing program. The initial beta builds are available for registered developers, but public beta releases typically follow soon after. iOS 11.3 beta includes new talking Animoji icons for iPhone X of a bear, skull, dragon, and lion, along with some other minor updates to the Health app, App Store, iBooks, and the inclusion of iMessages in iCloud. Additionally, iOS 11.3 includes a feature that allows user to disable performance throttling on devices with degraded batteries. MacOS High Sierra 10.13.4 likely focuses on various bug fixes, but the beta release also supports iMessages over iCloud, warns users about 32-bit applications performance, and includes the default iMac Pro wallpaper of a bursting blue paint cloud. Apple goes through several versions of beta system software before releasing a final build to the general public. It’s not entirely clear when the final build of iOS 11.3 or macOS 10.13.4 will debut, but Apple has previously said that iOS 11.3 would be released in the “Spring” and it’s fairly likely updates to each operating system software package will arrive at the same time.